St. Martin's Griffin, 9781250126665, 320pp. 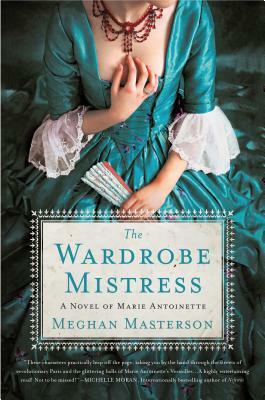 THE WARDROBE MISTRESS is Meghan Masterson's fascinating and visceral debut, an inside look at Marie Antoinette's luxurious life in Versailles remarkably juxtaposed against life in third estate as the French Revolution gains strength. A propulsive exploration of love, loyalty, danger, and intrigue...not to be missed. It's Giselle Aubry's first time at court in Versailles. At sixteen, she is one of Marie Antoinette's newest wardrobe ladies, in awe of the glamorous queen and her opulent life. As a budding designer, it's a dream come true to work with the beautiful fabrics and jewels in the queen's wardrobe. But every few weeks she returns home to Paris, where rumors of revolution are growing. From her position in the royal household, Giselle is poised to see both sides of the tensions erupting throughout France. When her uncle, a retired spy for King Louis XV, suggests that she casually report on the Queen as a game, she leaps at the chance. Spying seems like an exciting adventure, and a secret way to support Léon Gauvain, the handsome and idealistic revolutionary who courts her. Violence escalates as the uprising continues to gain momentum. Giselle grows closer to the Queen as her trusted servant, but finds herself dangerously torn. She must choose where her true loyalty truly lies, or risk losing everything...maybe even her head. MEGHAN MASTERSON graduated from the University of Calgary and has worked several unrelated jobs while writing on the side. As a child, she gave her parents a flowery story about horses every year for Christmas. She is drawn to strong historical figures and situations which present unexpected opportunities for her characters. Meghan loves reading at all hours, cooking, and going for walks with her dog. She and her husband live in Calgary. Meghan is the author of The Wardrobe Mistress.